Network analysis is a rapidly growing analytics domain propelled by the explosion of interest in social networking. The methods rest upon much older foundations in the realms of statistics and social science. Euler’s graph theory was proposed in the early 18th century and Moreno established the foundations for social network analysis (SNA) in the 1930’s. One of the exciting aspects of network analysis is the ability to generate elaborate and insightful visualizations. Indeed this can be a valuable tool for discovery and pattern identification. Open source social network analysis tools such as Gephi and commercial tools from SAS and SAP are available to guide inquiries. As an example, working with Gephi, I downloaded and generated a detailed visualization of pre-collapse Enron “to-and-from” email patterns. Inside Gephi, the visualization is interactive, allowing drill-down and zoom-out navigation to examine particular clusters and other structures associated with organizational communication patterns (see Figure 1). This ability can be quite useful toward identifying key players in a discovery initiative or forensics investigation – quickly identifying who to interview and where to seek additional information. However, going back to the roots of network analysis in mathematics and sociology, there are also formal statistical measures available from network structures. A key message is that network analytics is more than fancy visualization. 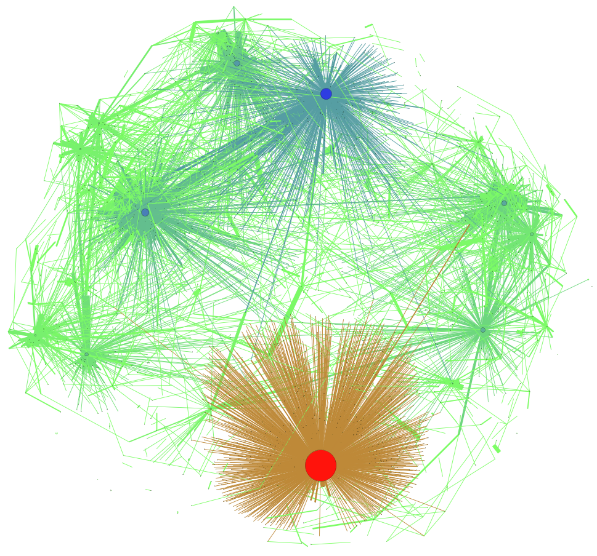 Graph mathematics and social network analysis (SNA) provide insightful statistical measures of networks. Resulting measures can supplement and enhance visualizations. As well, statistical measures can be used as formal components in data analytics and machine learning approaches. propinquity (measure of tendency of similar or co-located nodes to link). In another example, in a fraud investigation, fraud risk can be more heavily weighted when co-participants in a network (in aggregate) all have high risk scores. In other words, a ‘transaction chain’ involving several participants can be flagged for potential fraud based on an aggregate score involving all participants in the chain. As well, particular transaction patterns can be identified as suspicious based on a ‘library’ of fraud transaction patterns. As an example, cross-border carousel tax fraud can be described as a specific network pattern and flagged when detected in a large dataset of transactions (see Figure 2). By the same account, statistical measures can be helpful to delve into ‘deep structure’ – to identify factors and patterns not apparent to the naked eye. As an example, ‘hidden’ but influential participants in a network can be detected via standard statistical graph measures such as eigenvector centrality. In summary, network analysis goes beyond compelling visualizations. There are a rich set of statistical measures to be gleaned from graph statistics and social network analysis methods.